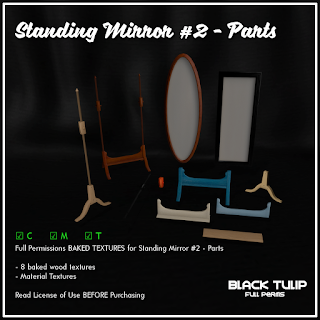 Baked textures sets for the Standing Mirror #2 - Parts mesh items (see related items). Material textures are also included. Select an animation on AVsitter.... And faces how/hide! 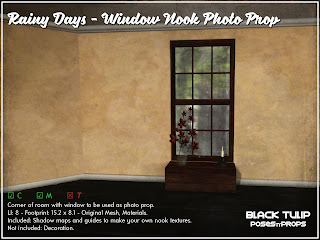 Studio photo prop consisting of a room section with a window. 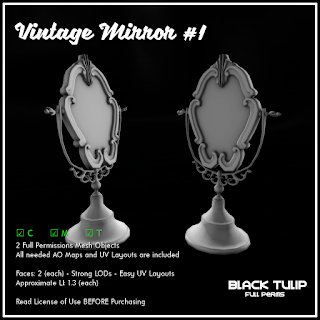 Shadow maps and guides are included so you can texture the studio as you prefer. Decoration on the photo is NOT included. 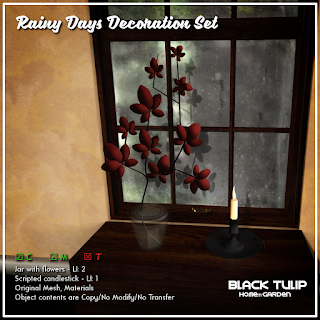 See related items for the decoration set. Jar with flowers, and a candlestick. 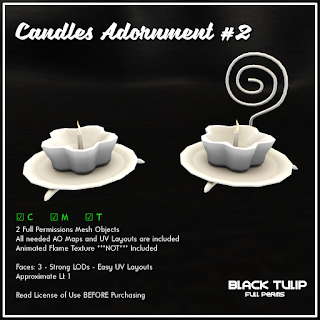 LI jar: 2, LI candlestick: 1 - Original mesh, materials. [Black Tulip] Poses - Pull! 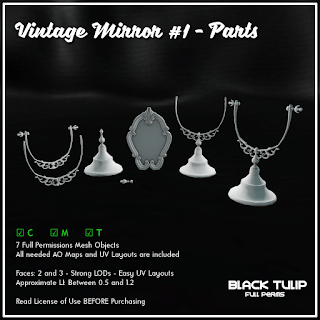 Avalaible at SL Marketplace: [Black Tulip] Poses - Pull! Six poses and corresponding mirrored ones. Scripted fountain with particles mist on/off and a choice of sound among six (or completely off). 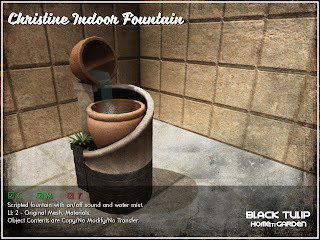 Animated water texture is NOT included. Please check related items. 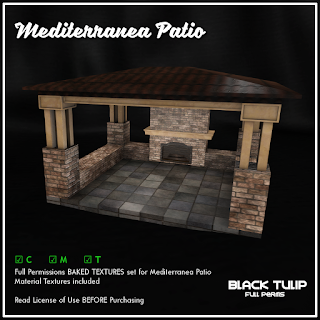 Baked textures set for the Indoor Fountain #1 mesh item. 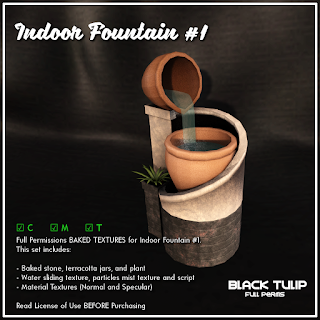 Material textures (normal and specular maps) are also included. 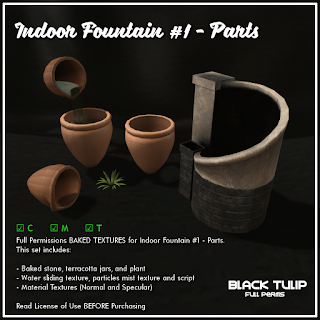 Baked textures set for the Indoor Fountain #1 - Parts mesh items. 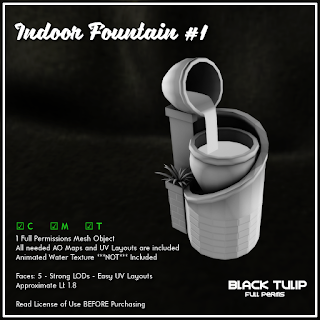 Material textures (normal and specular maps) are also included. 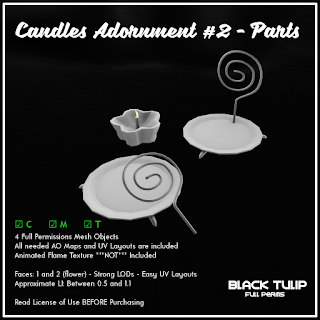 Baked textures sets for the Candles Adornment #2 mesh items (see related items). Material textures are also included. 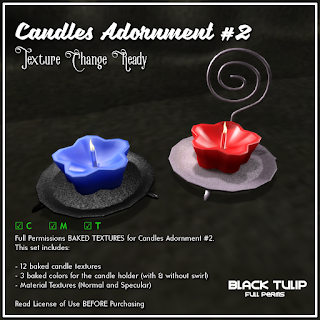 The textures set is Texture Change Ready: This means that they include a set of notecards ready to work with our texture changer script with materials, to help you speed your production time. Check this link for the script. 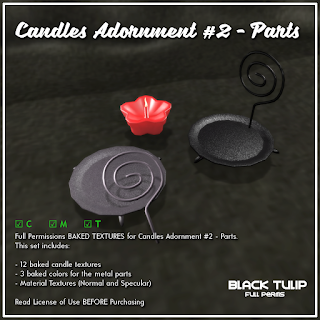 Baked textures set for the Candles Adornment #1 - Parts mesh items (see related items). 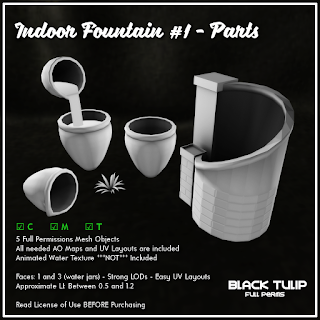 Material textures (normal and specular maps) are also included. 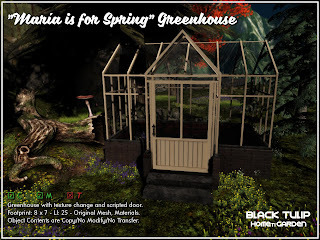 Greenhouse with texture change and scripted door. 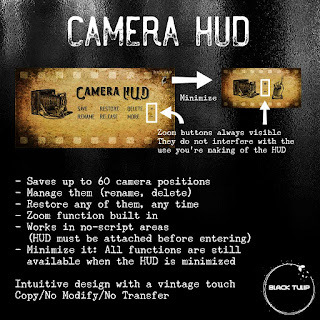 Object contents are copy/no modify/no transfer. 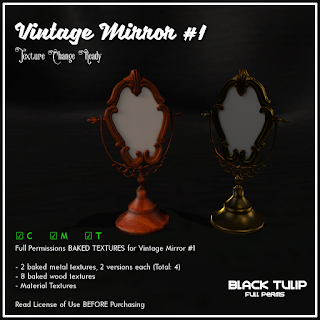 Baked textures sets for the Vintage Mirror #1 mesh item (see related items). Material textures are also included.